Enjoy our grilled flank steak seasoned with Italian dressing. 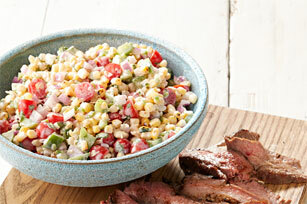 Top off the flank steak with our flavourful Mexican corn salad that starts with grilled corn. A great recipe for your summer barbecue. Score steak on both sides with shallow cross-cuts; place in shallow dish. Whisk dressing and seasonings until blended. Drizzle 3 Tbsp. dressing mixture over steak; turn to evenly coat both sides of steak. Refrigerate 10 min. Meanwhile, brush corn with 1 Tbsp. of the remaining dressing mixture. Grill 10 to 12 min. or until tender, turning and brushing occasionally with 1 Tbsp. of the remaining dressing mixture. Cool. Mix remaining dressing mixture, sour cream, jalapeño peppers and cilantro in large bowl until blended. Remove corn kernels from cobs. Add to sour cream mixture along with tomatoes, sweet peppers and onions; mix well. Grill steak 5 to 7 min. on each side or until medium doneness (160ºF). Remove from barbecue; let stand 5 min. Cut steak across the grain into thin slices. Serve with corn salad. Letting the cooked meat stand for about 5 min. to reabsorb its juices before slicing is the key to a great grilled steak.